One of the many family altars are set up to remember the deceased family members. 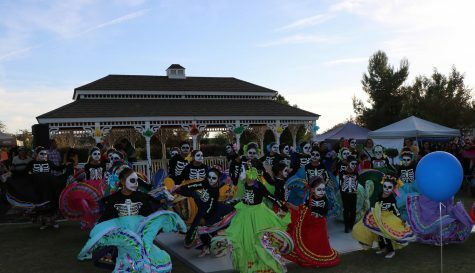 The Kern County Hispanic Chamber of Commerce (KCHCC) held its 10th annual Day of the Dead, or Día de Los Muertos, festival at the Kern County Museum on Nov. 6. 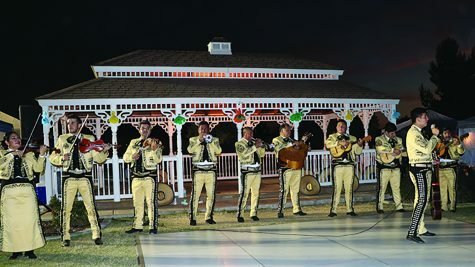 The festival had several Mexican commodities including traditional foods, dancing, music, and merchandise. Día de Los Muertos is a popular Mexican tradition that honors, celebrates, and remembers the dead. 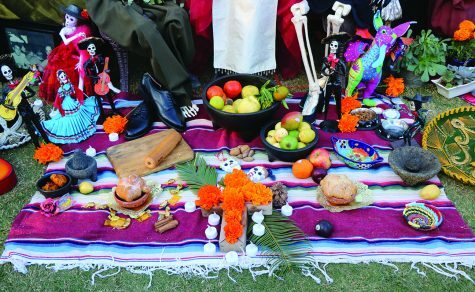 Family and friends of the deceased form special gatherings and set up altars decorated with the loved one’s favorite foods, drinks, and belongings. 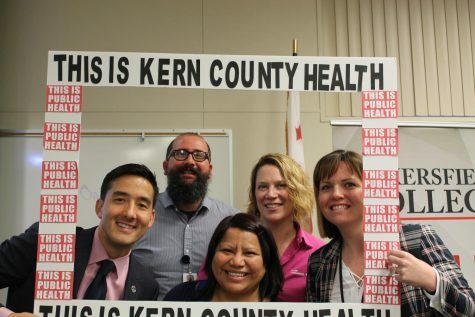 Jay Tamsi, President and CEO of KCHCC, talked about the celebration in a press release. Ballet Floclorico Huaztecalli preformed “Son de la Negra” at the KCHCC annual Dia de los Muertos. “This cultural tradition transcends communities and allows people to reflect on those they have loved the most,” Tamsi wrote. 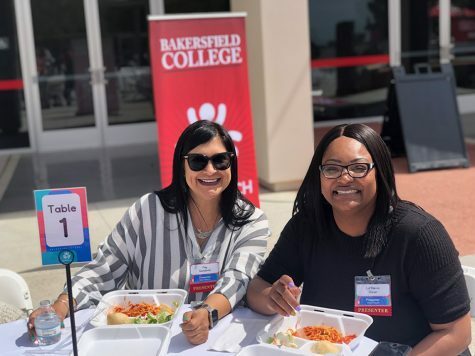 Several sponsors who presented and sponsored the event included Jim Burke, Dignity Health Mercy and Memorial Hospitals, Kern Federal Credit Union, Jarritos, Chevron, Valley Republic Bank, Kaiser Permanente, La Costa Mariscos and many more. Media sponsors included KGET 17, 96.9 La Caliente, El Popular, 92.5 La Campesina, 103.9 Beat, Hot 94.1, and Noticiero Telemundo. 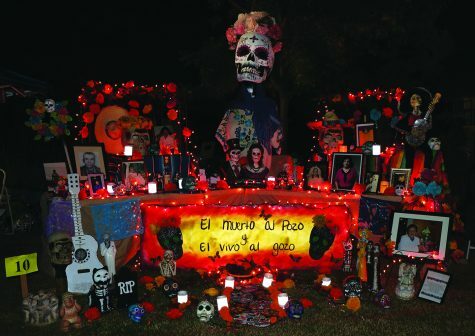 Most altars are decorated with the deceased person’s favorite food, possessions and pictures of them. 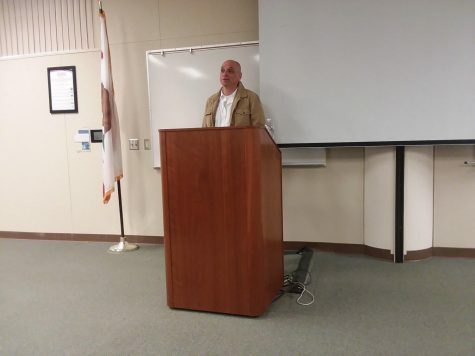 Elia Armendariz, Valley Republic Bank representative, decided to come to the event to contribute to the local community and represent as a member of the KCHCC. Armendariz explained what the day of the dead meant to her. 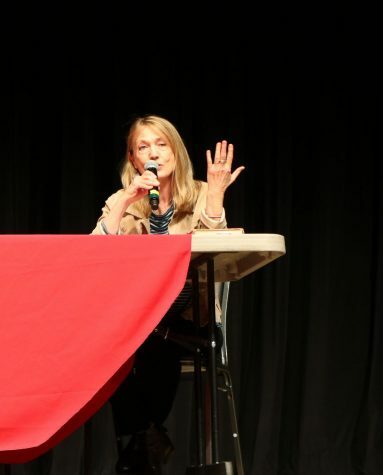 “To me, it’s a thing to remember all my loved ones,” Armendariz said. Armendariz added that it was great being tat the event to be part of the community and being involved and that it was deeply meaningful to her. The festival featured live performances. One of the popular sights were the family altars. 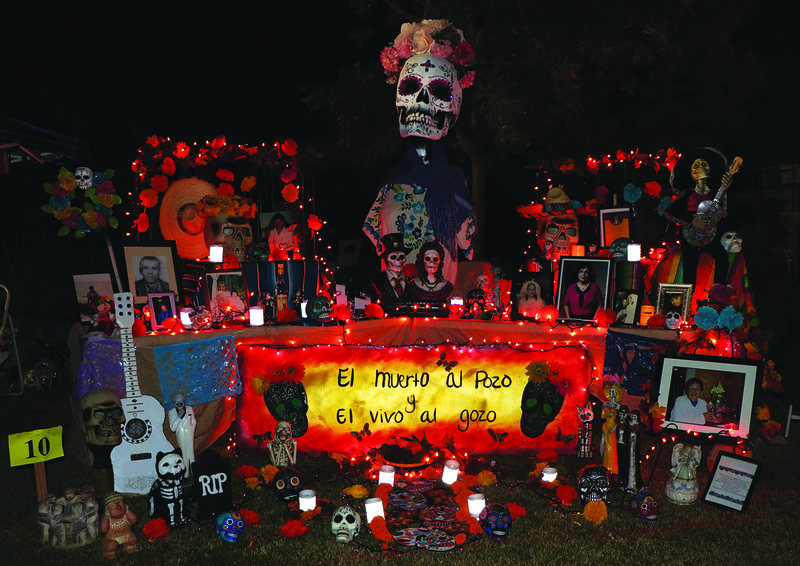 Many of the altars were decorated with candles, flowers and photos of the family loved ones who had died. Denise Negrete, an attendee, said she and her family have been to the festival in past years and have set up altars to bring out memories. Negrete’s altar featured the favorite food of her deceased relatives. “We were told to bring out what they like to eat, their favorite food…my aunt, she used to like the fried shrimp from rice bowl, the hot wings from KFC…We always make the tamales, the pan dulce, chicharrones and it’s just something they used to like to eat,” she said. Rick Waldron, an attendant, said he decided to make an altar “just [to] keep the memories going,” he said. One of the four family altars were dedicated to two of his brothers (Chris and Kevin) who recently died. “I have one brother that passed away two years ago so we decided to make one altar for him; unfortunately, we had to do it again this year for my little brother,” he said. 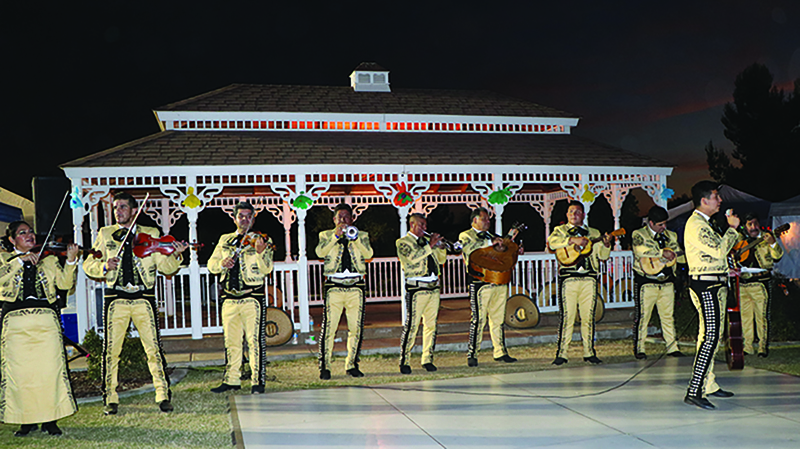 Mariachi San Marcos performed the covers “La Venia Bendita” and “Tatuajes” for community members.